How to watch DVD movie on iPhone (XS/XS Max/XR)? You should rip DVD to iPhone accepted video format first. The iPhones have hit the market with record popularity, along with new iPods boasting higher quality video and vibrant display resolutions. This article is for all those iPhone owners who are still searching for ways to convert DVD to iPhone video format. To begin with you need to know the formats iPhone can play besides games. iPhone supports the exact same set of video formats as the current iPad Pro and iPod touch, meaning that video exported for use on the iPods should be immediately usable on the iPhone. General Media Formats Supported by iPhone XS/XS Max/XR etc. ▶ H.264 video: up to 4K, 30 frames per second, High Profile level 4.2 with AAC-LC audio up to 160 Kbps, 48kHz, stereo audio or Dolby Audio up to 1008 Kbps, 48kHz, stereo or multichannel audio, in .m4v, .mp4, and .mov file formats. ▶ MPEG-4 video: up to 2.5 Mbps, 640 by 480 pixels, 30 frames per second, Simple Profile with AAC-LC audio up to 160 Kbps, 48kHz, stereo audio in .m4v, .mp4, and .mov file formats. ▶ Motion JPEG (M-JPEG) video: up to 35 Mbps, 1280 by 720 pixels, 30 frames per second, audio in ulaw, PCM stereo audio in .avi file format. ▶ Audio formats: AAC (8 to 320 Kbps), AIFF, AAC Protected (MP4 from iTunes Store), MP3 (8 to 320 Kbps), MP3 VBR, Dolby Digital Plus (E-AC-3), Audible (formats 2-4), Apple Lossless, WAV. Now to watch the DVD movies and videos what you need to do is sim ply to rip DVD to iPhone. It is quite easy to change DVD movies to iPhone compatible ones with the aid of dedicated DVD ripping program. And taking all factors into consideration, clean and fast WinX DVD to iPhone Ripper is the ideal choice. WinX DVD to iPhone Ripper is specially designed to help all Windows users convert DVD to iPhone, as well as iPod, Apple-TV and iTunes with powerful functions. 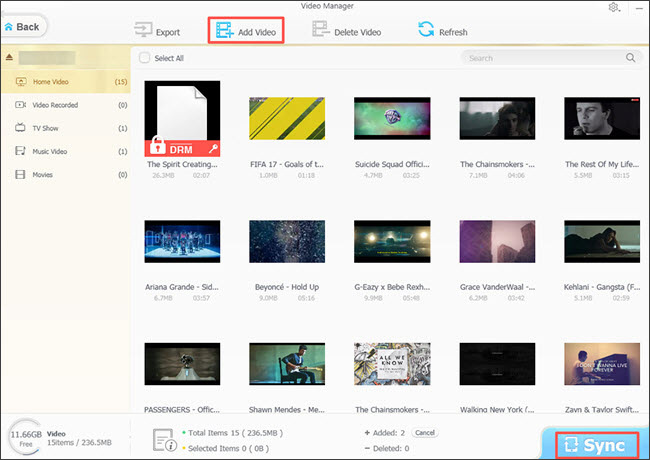 As one of the best DVD to iPhone tools, it's able to remove DVD copy protection like region codes, CSS, RCE, Sony ArccOS, UOPs and Disney X-project DRM easily without third-party codecsand, producing excellent output video quality with rich video editing settings built in. 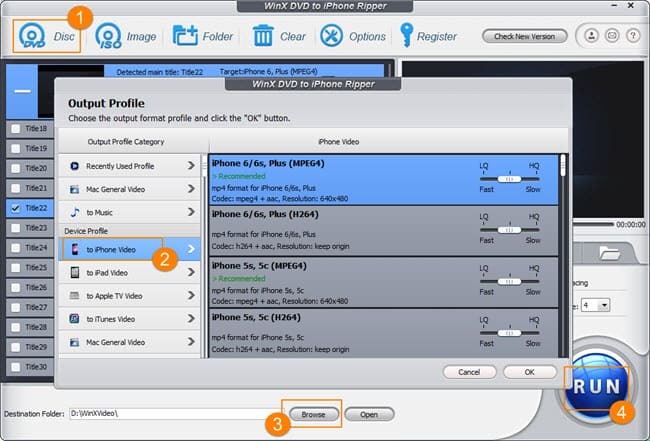 WinX DVD to iPhone Ripper can rip all copy protected or not DVDs to iDevice, iTunes, Apple TV and Mac computer effortlessly without any video degradation of video quality. Considerably, it provides nearly all new and classic Apple device choices for output, like iPhone XS/XS Max/XR, iPhone 8/8 Plus, iPad Pro, iPad mini 4, iPad Air 2, iPod touch, Apple TV, iTunes, and Mac MP4/MOV/M4V format. Besides the basic functions, this DVD to iPhone converter also allows you to clip segment you favored, as well as adjust video quality by parameter setting, customize video file size, add subtitles, etc. Free Download WinX DVD to iPhone Ripper now to rip DVD on Windows 10/8/7 by following the guide below. Run WinX DVD to iPhone Ripper, you can load real DVD movie by click "DVD Disc" button, or ISO image, DVD folder. After loading DVD, the DVD's information, such as title, subtitle, duration and output profile will be shown in the file list. Select an output format, like "iPhone 7, Plus (H.264)" from the auto pop-up Output Profile window. Click "Browse" button in output setting area, select destination folder in the dialog box that opens, then click OK.
After finishing the above settings, check the files needed to convert in the file list, and click "RUN" button on the main interface, to start converting the movie. You can view the conversion progress from the progress bar at the bottom of the dialogbox. When the conversion is completed, just transfer the converted files to iPhone with iTunes. If you don't like this Apple-owned iPhone file syncing tool, please try some best iTunes alternative like WinX MediaTrans. Guide on how to transfer DVD to iPhone XS/XS Max/XR/8/7/6S/6 (Plus). Convert DVD for iPhone with best fastest DVD to iPhone converter, and put DVD movie video to iPhone (XS/XS Max/XR/8) for playing on the move.